Origin Energy 2001 - 2011 ADA was contracted by Origin Energy in 2001 to plan and manage Origin's offshore drilling campaigns. This started with the planning and execution of the Yolla development campaign and was followed by an exploration well (Trefoil-1) in the Bass basin. 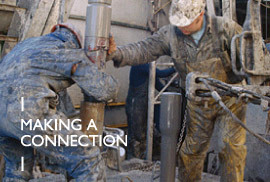 The success of these drilling campaigns ensured that ADA retained the drilling management services for Origin's following project, the Kupe development, located in the Taranaki Basin within New Zealand, successfully completed in 2008. Our next project was a 4 well drilling campaign part of the Kan Tan IV drilling consortium. Stuart Petroleum 2008 Stuart contracted ADA to provide well engineering and complete drilling project management services for a well in the Gippsland basin, and which was part of the West Triton jack-up Drilling Consortium. Stuart later contracted ADA to manage the drilling of a single well in the Browse basin as part of the Songa Venus Drilling Consortium. 3D Oil 2007 ADA was contracted by 3D Oil to provide well engineering and complete drilling project management services for two wells drilled in the Gippsland basin as part of the West Triton jack-up Drilling Consortium. Tap Oil 2007 ADA was contracted by Tap Oil to provide well engineering and complete drilling project management services for two exploration wells in the Bass basin, which are part of the Kan Tan IV semi-submersible Drilling Consortium. Apache Energy 2007 ADA was contracted by Apache Energy to provide drilling operations management services for three wells in the Gippsland basin as part of the West Triton jack-up Drilling Consortium. Todd Energy NZ 2006 - 2007 ADA performed pre-engineering work for an offshore project for Todd Energy within New Zealand. Petratherm 2007 Petratherm contracted ADA for engineering and design work for their geothermal well in South Australia. Nexus 2007 ADA was contracted by Nexus for initial drilling engineering planning of the Longtom well. This was followed by the award of well engineering and complete project management for two additional wells in the Gippsland basin, one as part of the West Triton jack-up drilling consortium and the other as part of the Kan Tan IV semi-submersible drilling consortium. ADS 2008 ADA completed a single well exploration drilling project for Asian Drilling Services (ADS) / STP Energyin New Zealand's Taranaki basin, using the Ensco-56 Jack up drilling rig.